Hemanth Kadambi is an archaeologist and historian of ancient and early medieval India. He earned his doctorate in Anthropological Archaeology from the University of Michigan, USA and it has to do with the early medieval polity of the Calukyas of Bādāmi. In this monologue, Dr Kadambi raises and discusses two themes: first, he goes beyond the dynastic and architectural history of the Calukyas of Bādāmi and second, he discusses what archaeological understandings of the built environment of the Early Calukyas can tell us about the context of the Calukya constructions. He also briefly touches upon the religious affiliations of the Calukyan temples, especially at Aihoḷe and talks about the local and lesser known deities in the region. The Early Calukyas dynasty was one with imperial ambitions in the middle of the first millennium CE (c. 550‒c. 750 CE), located in the Deccan Plateau. 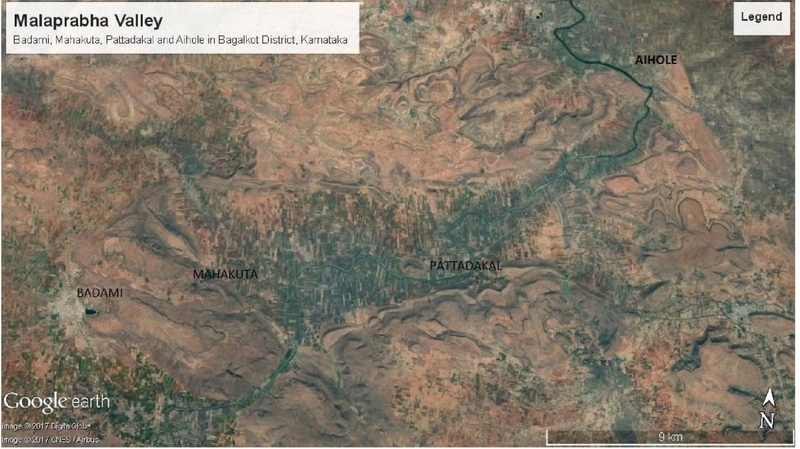 Their nucleus of settlements was along the seasonal Malaprabha river valley, which is a tributary of the larger Krishna river that flows in north Karnataka. This dynasty is referred to as the ‘Early’ Calukyas (also as Calukyas of Badami/Vātapi) to distinguish them from their eponymous successors, referred to as ‘Later’ Calukyas (also as Calukyas of Kalyāṇa), who ruled further east along the Krishna river but in the same general region in medieval times (11th century‒13th century CE). Scholarship within art history, epigraphy and architecture, and, to a limited extent, archaeology, in the last century has collated a wealth of information on the chronology, territorial extent, dynastic succession, religious affiliations, and, to some extent, the sociological and demographic character of the period of the Early Calukyas. This diverse scholarship has yielded a good understanding of this dynasty’s contributions to early Indian history. Thus, we know that, alongside the Pallavas in Tamil Nadu, the Early Calukya elites were pioneers in stone temple constructions initiating and evolving distinct styles of architecture and iconography (Michell 2011). They exhibited, possibly for the first time in the southern Deccan, imperial tendencies by way of taking every opportunity to amass territory, more than was done before, and also retaining such territories with a complex web of kin and military relations, and subordinations (Ramesh 1984). In this essay, I begin by outlining the focus of art and architectural studies in the Malaprabha region. This is not intended to be a detailed exposition of the art, architecture and iconography of the Calukya constructions, for which I defer to a wealth of scholarship available. However, I do raise and discuss two themes: first, I move beyond known dynastic and architectural history of the Early Calukyas; specifically, what archaeological understandings of the Early Calukya built environment can tell us about the context of the Calukya constructions. And second, the way to begin examining this contextualized history within larger theoretical debates in early medieval Indian historiography. North Karnataka, and the Malaprabha valley in particular, has a continuous history of human occupation. The evidence for this includes rock paintings, remnants of stone tools such as hand axes, Neolithic ash mounds, grinding stones, pottery, iron-age megaliths, early historic brick architecture, religions and rituals, down to the more familiar monumental architecture such as stone temples and other religious shrines along with written sources, which provide the picture of this region for the last millennium and a half. In all, a historical outline of the last 100,000 years or more may be attested with all this evidence, alluding to the significance of this region and the story of humanity here. It is, therefore, no surprise that the Calukya polity settled this region which had cultural antecedents. If we look at the period of the rise of aggregated political hierarchies, wherein territorial sovereignty became a foundational principle, we see the Satavahanas (c. 100 BCE‒150 CE) as the first polity. They were followed by the Kadambas (c. 300‒600 CE) in this region. Both these polities claimed territories in and around the Malaprabha valley as seen from some evidence of their building activities (Rao 1972). However, the Malaprabha valley becomes the focal point in history, culture and politics from the middle of the first millennium CE when the Early Calukyas start their reign from this region, eventually expanding their domain over large swathes of peninsular India. But clearly, any casual observer and scholar would recognize the presence of monumental stone architecture from the mid-6th to the mid-13th centuries CE as the most significant phase in this built-environment of Aihole. I focus here on the period between mid-6th to the mid-8th century CE, corresponding to the reign of the Early Calukyas (Figure 2). The Early Calukyan architecture includes different categories of constructions: cave temples, free-standing structural temples, independent columned ‘halls’, reservoirs/tanks, memorial stones, fortifications, doorways and small shrines. Studies of religious constructions such as rock-hewn caves and structural temples have received the most focus, although scholars have paid attention to fortifications and doorways too. These studies, as noted earlier, have resulted in excellent gazetteer-like scholarship alongside detailed analysis of architecture and iconography of these temples. Such scholarship has contributed to conversations about dynastic history but, more importantly, they have contextualized Early Calukyan architecture in terms of the history of Indian art and architecture more broadly. The broad consensus has been that Early Calukya sites in the Malaprabha valley formed a ‘cradle of Indian temple architecture’. While scholars have a broad consensus on the mentioned schema and the list of temples that are categorized under the aforementioned classification and the evolution of the respective styles, there are many individual temples that are debated for their stylistic affinity. I will not expand on these debates here, but it would be sufficient to say that architectural classifications of this kind have resulted in cross-regional comparisons with temples built in earlier or later in Karnataka and neighbouring regions of Tamil Nadu under the Pallavas, or in the Telangana/Andhra regions. This is a valuable exercise and has a separate genealogy of scholarship in itself. However, broader questions that go beyond monumental architecture and the general built environment have yet to be addressed seriously. For instance, what did the monuments, the temples, caves, reservoirs, forts, doorways, etc., signify for the people who dwelt in the Malaprabha valley? What local, non-royal connections, if any, might have existed in these constructions? Were these connections new; in other words, did the Calukyas sponsor new constructions keeping in mind their own unique identity or did they identify with pre-existing local identities? A century or more of epigraphical research (Padigar 2012) has given us a wealth of information on the society of the Early Calukyas, as mentioned above. Accordingly, we know that the Malaprabha valley had non-ruling elites such as merchant communities who might also have been administrators (e.g., the mahajanas [merchants] of Aihole) or that there were separate professional groups such as oil-extractors, florists, musicians, sculptors (many itinerant), farmers, etc. We also have a reasonable understanding of their social hierarchy wherein royalty and Brahmin and Jain priests were significant personages. Grants of land and accompanying resources were often made by the Calukya royal family and these stone and copper-plate charters sometimes carried messages such as merchants and traders being exempt from paying taxes, or Brahmins and Jain priests to exclusively ‘enjoy’ the privileges of the grants for generations, etc. Grants for shrine and temple constructions were also made by non-royalty such as merchant groups, women, etc. An interesting aspect noticed within Calukyan epigraphy is the innumerable names inscribed randomly across the sites in Badami and Aihole. The convincing suggestion is that these were visitors who came to take in a religious and urban experience. Interestingly a lot of these names do not neatly categorize into convenient caste or jāti nomenclature, implying a diverse reckoning of identities, perhaps beyond ‘Hindu’, ‘Jain’, ‘Buddhist’, etc. The archaeology of the Early Calukyan sites has been limited till date. Excavations conducted at Aihole, Pattadakal, and Badami were undertaken to ascertain the relationship of early Calukyan temples with each other (i.e., to establish a chronological sequence of some key temples) (Rao 1972). These excavations have also documented pre-Calukyan remains such as pottery and bricks said to be from the early centuries of the first millennium (i.e., ‘Sātavāhana’). More recently, excavations at Naganathakolla and Bacchinagudda, near Pattadakal, have resulted in the documentation of pre-Calukyan remains (‘Sātavāhana’) and even a possible Calukya-era quarry (Sundara 2008: 91). However, none of the above excavations have researched the questions of the relationship of the Calukyan-era monuments with their larger social and political landscape. My recent doctoral research addressed these themes (Kadambi 2011). I conducted a 5 sq. km intensive archaeological survey at Aihole and documented several hundred sites that yielded pottery, small lithics (human-modified stone fragments), memorial stones, columned halls, doorways, megalithic dolmens, water-retention features, small shrines (such as ‘nāga’ stones), and at least one ruined structure. Analyses of the pottery and other evidence has suggested that Aihole was not just a temple or religious landscape but also a lived site with much mundane, everyday activity taking place. The richness of the social groupings as indicated in the inscriptions has partly bourne out from this research. In addition, the monumental temples shared their space with other forms of memorial architecture such as megalithic dolmen constructions and ‘hero’ stones, imparting a diversity of sacredness that was not recognized earlier (Kadambi 2011). One of the more interesting results that emerged in my research is the relationship between royalty and non-royalty. Moving beyond the temple landscapes of the Malaprabha valley, my research looked at the engagement of possible non-royal religious/ritual activity with Early Calukya claims regarding their ritual affiliations in their inscriptions. The Calukyas claimed to be nourished by the seven divine mothers or the Saptamātrika. Research on pastoralists such as the Dhangars of the Deccan by ethnographers such as G.D. Sontheimer (1989) has linked pastoralist myths regarding Yellamma (mother of seven, recalling the Saptamātrika) with Puranic deities such as Reṇuka/Aditi, the fertility goddess. Reṇuka/Aditi figures prominently in Puranic stories wherein she was beheaded by her son Paraṣurāma on the orders of her husband, sage Jāmadagni. This legend also carries the imagery of a revived Reṇuka/Aditi as having a lotus head. The sculptural equivalent of this revived Reṇuka/Aditi is noticed by art historians such as Stella Kramrisch and Carol Bolon in the Lajjā-Gauri images particularly abundant from the Early Calukyan sites. Moreover, the myth of the pastoral goddess Yellamma, who is said to have been co-opted by the Saiva pantheon, but not before she displayed herself as a master of 52 magical sciences and with outspread legs such as seen in Lajjā-Gauri portrayals, strongly suggests the possibility that Yellamma, Lajjā-Gauri, and Reṇuka/Aditi are one and the same deity. Indeed, the ninth-century Renuka temple in the north‒south pastoral tract at Saundatti in the Belgaum district of Karnataka is located on the hill locally called Yellamma-guḍḍa (Yellamma-hill). Pottery from this hill area dates from the first few centuries of the Christian era suggesting the strong possibility of pastoral ritual beliefs and their landscapes being co-opted by dynasties such as the Early Calukyas. Badami has a cliff face which was colloquially called the North fort of the 52 rocks, recalling Yellamma being he master of 52 magical sciences. Moreover, in the shadow of this cliff face is the 11th‒12th century Yellamma temple. The above-mentioned connections that my research has been able to demonstrate suggests the following. One, the Early Calukyan temple monuments, which have been the focus of scholarship within chronological and typological debates, do not always give us the whole picture regarding religious and ritual performances in their sacred landscapes; and two, that a broader contextual analysis of archaeological and architectural investigations is better suited to answer broader questions that can construct a dynamic landscape in history. The period between c. 600‒1200 CE is called the ‘Early Medieval’ in Indian historiography. Much debate surrounds this terminology, based mainly on the nature of changes in these centuries from an earlier ‘Early Historic’ period. Simply put, there are those scholars who believe that the Early Medieval period was a phase of ‘feudalisation’ of Indian society, which included decentralisation, deurbanisation, and a general deterioration of the condition of agricultural communities to serfdom (Sharma 1965; 2009), and those who believe that it was a period of integration/convergence i.e., local state formations, no de-urbanisation, co-option and integrations of various groups of people in broader pan-Indian systems of politics, religious and social hierarchies, such as the varṇa-jāti (caste system) (Chattopadhyaya 1994; Kulke 1993). Both these dominant positions in Indian historiography have sought to study various dynasties, polities, etc., all over the subcontinent to establish their respective historiographical positions. However, if one notices the chronological range of this period, we see the curious absence of the Early Calukyas in either of these positions. In other words, the research of early Calukyas has not been considered adequately to substantiate either position. My intention is not to do so either. Instead, I want to draw attention to a much more interesting perspective, albeit aside from the debates regarding the political processes outlined above. My research, based as it is in anthropological methodology of interdisciplinarity, has shown that local histories can be investigated to portray a dynamism that can inform us on political process much more fully than art, architectural and dynastic history has so far done. While much more work needs to be done in this direction, there is no doubt that archaeological research presents a richer localized picture that can explicate lived scenarios rather than theoretical processes that do little to further our understanding of life in the past. [i] See Ramesh 1984 for a complete listing of the territories brought under the imperial umbrella of the Early Calukyas; Michell 2011 is a recent, well-illustrated and detailed tour guidebook, which a casual visitor and a scholar can keep handy. [ii] Gold, found near Aihole in the village of Bailhongal, may or may not have been mined during Calukyan times but there is clear evidence of gold being mined at Hatti in Raichur (Sundara 1975). [iii] I do not give details of these styles here as that is of limited concern in this essay. Nonetheless, the respective styles referred to have been critically debated in scholarship and cannot go unremarked in any study on the Early Calukyas. Bolon, Carol R. Forms of the Goddess Lajja Gauri in Indian Art. University Park, PA.: Published for College Art Association by Pennsylvania State University Press, 1992. Chattopadhyaya, B.D. Making of Early Medieval India. New Delhi: Oxford University Press, 1994. Kadambi, Hemanth. ‘Sacred Landscapes of Early Medieval South India: The Calukya State and Society.’ Unpublished PhD dissertation, University of Michigan, Ann Arbor, 2011. Kulke, Hermann (editor). Kings and Cults: State Formation and Legitimation in India and Southeast Asia. New Delhi: Manohar Publishers and Distributors, 1993. Michell, G. Badami, Aihole, Pattadakal. London: Jaico Publications, 2011. Padigar, S.V. (editor). Inscriptions of the Calukyas of Badami. New Delhi: Indian Council of Historical Research, 2012. Panchamukhi, R. S. ‘Badami Inscription of Chalikya Vallabheshwara, Saka 465.’ Epigraphia Indica 27 (1986 [1947‒48]): 4‒9. Ramesh, K. V. Calukyas of Vatapi. New Delhi: Agam Kala Prakashan, 1984. Rao, S.R. ‘A Note on the Chronology of Early Calukya Temples.’ Lalit Kala 15 (1972): 9‒18. Sharma, R.S. Indian Feudalism (c. 300‒1200). Calcutta: Calcutta University, 1965. ———. Rethinking India’s Past. New Delhi: Oxford University Press, 2009. Sontheimer, G.D. Pastoral Deities of Western India. Translated by Anne Feldhaus. New York: Oxford University Press, 1989. Sundara, A. Early Chamber Tombs of South India. New Delhi: University Publishers, 1975. ———. World Heritage Series-Pattadakal. New Delhi: Archaeological Survey of India, 2008.